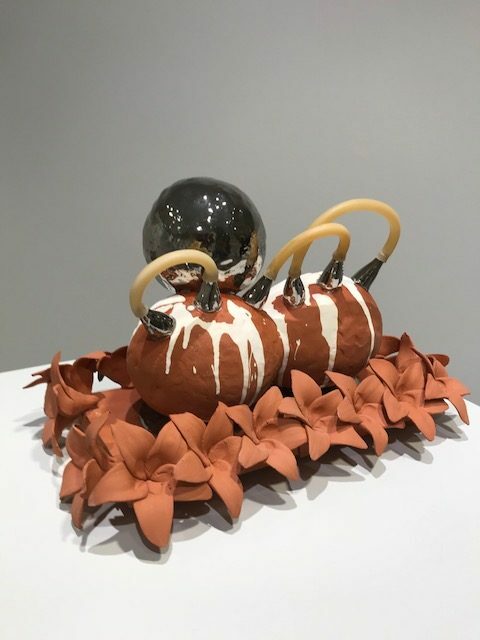 In this collection, all of the eight individual structures are made from the same basic materials: terra cotta clay, house paint, platinum luster, latex tubing, and sometimes, salt. All of the different pieces are unified by the same basic artistic shapes, colors, and components as well. Each has a shiny silver ball or cone shape, terra cotta flowers, and either a spherical or oblong terra cotta centerpiece. All but one contain some form of what looks like the metal framework that you see in early stages of construction to support buildings. The artist’s short statement at the entrance of the gallery states that the collection is an autobiographical series composed of playful forms, which remind him of moments he treasures. As I was walking through the gallery, and soaking up the art, I was curious as to what memories inspired each piece. I really could not tell, and still don’t have any inkling of what the art means. Regardless, it was fun to ponder the way that our own memories work and invoke images in our minds, however indecipherable by others. The art was a reminder that we all have wonderful moments, gems of time in our lives that we will wear forever. My favorite part of the collage of shapes that compose each structure is the array of flowers. They are bare clay, lovely and lively and natural additions to an otherwise quite abstract sculpture. The flowers are grounding in a way, and remind the viewer that the art is playful and inspired by goodness. Flowers are symbols of love–given on birthdays and celebrations of joy, and also commemorating loved ones who have passed. They are reminders of memories made and lives had. In contrast to the plain terra cotta flowers are the glinting dashes of metallic paint, coating elegant spheres and spouts and cone shapes. These feel to me like the climax, the peak, of the memory–the shining moment that has really stuck in the artist’s mind. They are attention-capturing and bright. Now the salt: a very interesting concept that also adds texture and movement to the sculptures. The salt and the metal-looking bar frames are what reminded me of the exhibit’s name: Play Structures. They look a little bit like playgrounds: the salt could be the sand or mulch on the ground, with flowers growing from the earth, and the metal clay bars are jungle gyms, monkey bars, to climb and to use for support. Taking all components into account, this exhibit inspires my curiosity about the artist’s experiences and stories, it reminds me of my own memories, and all the conditions–people, places, lives, spontaneous happenings–that came together to create these moments. REVIEW: What Were You Wearing?